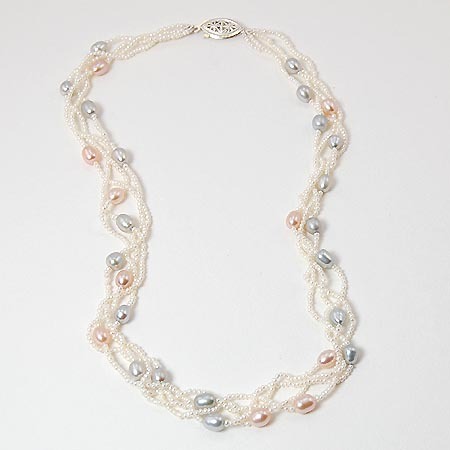 A graceful four-strand white baroque freshwater seed pearl necklace hand-strung with pale blue and soft pink egg-shaped freshwater pearls. The necklace is a divine timeless item, perfect for a feminine touch with a nice luxurious look. Each pearl is hand-selected and arranged to create a pleasing pattern. The necklace measures 18 inches, including the intricate oval sterling silver clasp at the end. These pearls are a must-have vintage item!